I live in Singapore and I welcome you to my personal page of what i like to do when i am not at work. Most of it is related to my birdwatching, nature and heritage experiences and trips. Cheong Keong Ann alias Nyachee was the eldest daughter of Mr and Mrs Cheong Koon Seng. 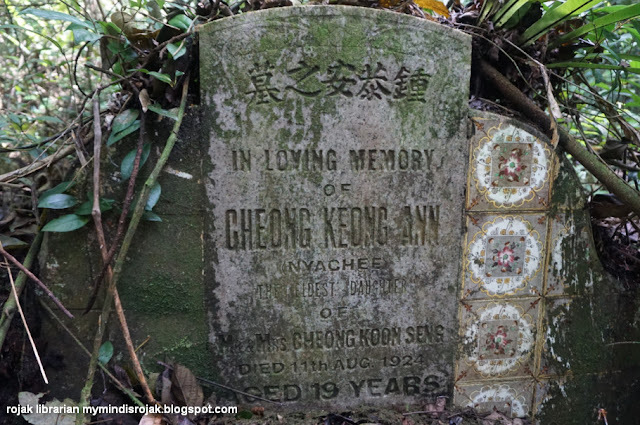 Cheong Keong Ann passed away at the age of 19 on 11th August 1924. She is buried in Hill 1 E, plot 146. 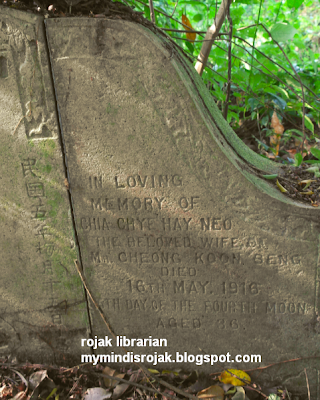 From a posting in geni.com, it is said that Cheong Keong Ann is the daughter of Chia Chye Hay Neo. There is very little information about her other than the fact that she was listed as the eldest daughter of Cheong Koon Seng 鍾坤成, the proprietor of Messrs. Cheong Koon Seng & Co. and holds the honor of being one of the best known pioneer local auctioneers and estate agents in Singapore. Cheong Koon Seng passed away peacefully at his residence, "Valley-side" in No 299 River Valley Road at 9 am on March 20, 1934 at the age of 55. 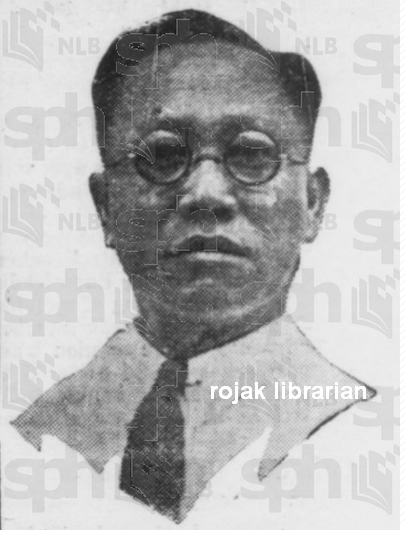 He was survived by his wife (Chia Siew Tin), three sons ( Cheong Hock Chye, Cheong Hock Guan and Cheong Hock Leng), 4 daughters (Cheong Keong Poh,Cheong Keong Tee, Cheong Keong Tuan, Cheong Keong Hee, and 1 adopted daughter, Cheong Keong Hiok) and 4 grandchildren. Cheong Hock Chye started his own auction firm, Cheong Hock Chye and Co, Ltd at 1-A, Raffles Place in 1940. Cheong Hock Chye, J.P passed away at the age of 49 on 27th February 1949. He is survived by his widow, 2 sons (Cheong Thiam Siew, Cheong Thiam Gee and Cheong Thiam Chin), 2 daughters(Cheong Liang Neo, Cheong Tian Neo), 2 daughters-in-law, 1 son-in-law and 1 granddaughter. The cortege left from No 6 Brighton Avenue to Whitley Road Burial Ground. Miss Cheong Keong Poh (eldest daughter of the late Mr. Cheong Koon Seng and Mrs Cheong Koon Seng) got engaged on September 1935 to Mr. Chan Chee Seng (eldest son of Mr. and Mrs S. J. Chan). Miss Cheong Keong Tee (2nd daughter of the late Mr. Cheong Koon Seng and Mrs Cheong Koon Seng) got engaged on October 1936 to Mr. Ang Kim Sye of the Bankruptcy Office (6th son of the late Mr. Ang Seah Im and Mrs Ang Seah Im). Miss Cheong Keong Tuan (3rd daughter of the late Mr. Cheong Koon Seng and Mrs Cheong Koon Seng) got engaged on January 1936 to Mr. Koh Kong Hai (6th son of Mr and Mrs Koh Sek Lim of Geluga Bedoh Estate, Singapore). Nature has a lot to teach us, if only we stop to pay attention.